Google Maps first started showing speed limits in select cities in the Bay Area all the way back in 2016. The feature was expected to make its way to other cities over time, but that never happened. Today, Android Police spotted speed limits showing up in cities where they weren’t visible earlier. People in some areas of the United States outside of the Bay Area are starting to see speed limit notices on their app during navigation. 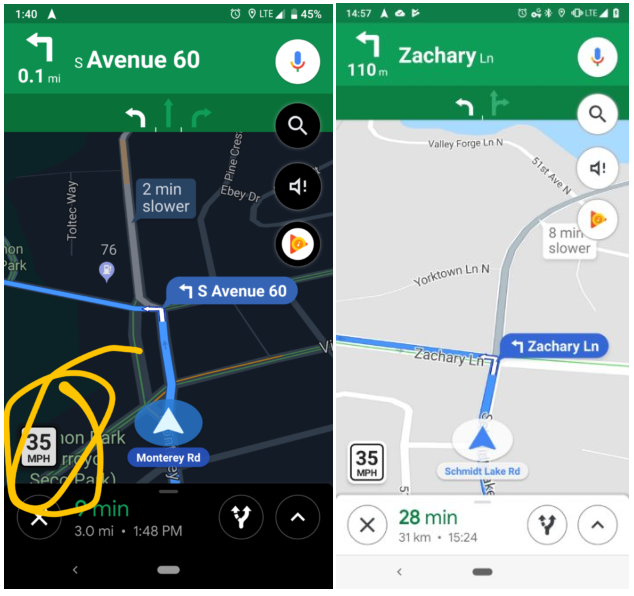 User from New York City, Los Angeles, and Minnesota are all seeing speed limits live in Google Maps navigation. You will see the marker show up in the bottom left corner while using turn-by-turn navigation. It seems Google is finally confident enough to start making it more widely available. However, it may be a long time before it shows up in cities outside of the US. Considering that it took almost three years for it to break out of the bay area, it wouldn’t be surprising if it took an equal amount of time to find its way to other US cities. Let’s set aside any expectations for locations outside of the US for now. There’s even a chance that some areas might never see the feature. It is unclear as to why the feature took so long to show up. Google has remained largely silent on the matter, but it is reasonable to assume that they’ve had their share of difficulties. The tech giant often uses the Bay Area as a testing ground for yet-to-be-released features and it is common for some Bay Area specific features to stay there for extended periods of time. We haven’t seen any Google Maps app updates lately, which means this is a feature being rolled out via a server-side switch. Regardless, we’re glad to see it supported on a wider scale. If you happen to see the feature live on your device, let us know in the comments.